There’s a lot that goes into organizing an estate sale. 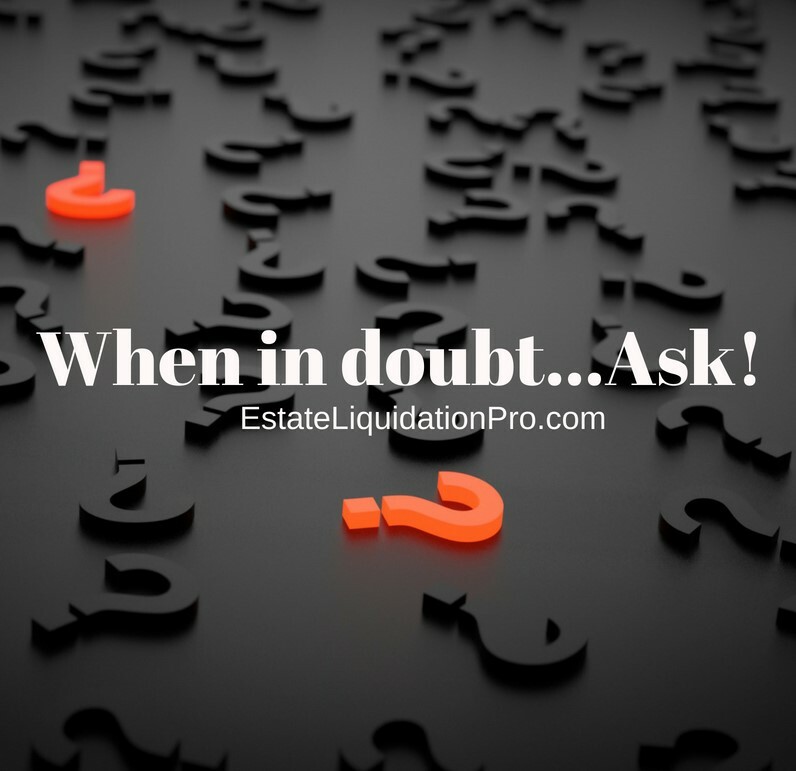 Professional estate liquidators understand the process of organizing, researching, pricing, marketing, but an on-site estate sale doesn’t always justify the cost of organizing a sale, and an estate buyout is more beneficial. When Estate Sale Organizing Doesn’t Make Sense! Many estate sale companies will not accept holding an estate sale on-site simply because there’s not enough in the home to justify the cost involved in holding a sale. Most estate sale companies earn their income based on commissions. If there’s not enough items in the home, and an estate sale company turns you down, it’s in your best interest to agree. Other times, an on-site estate sale is not allowed in the community where the home is located. Whether the property management company doesn’t allow it, ordinances within the city, or homeowner association rules simply say no! But you’re still ready to get rid of all the items and don’t know where to start. You have options. Our Orange County Hauling & Estate Liquidation Services are unique because we never say no. Whether you want to sell all the contents of a home, only the items in the garage, or want debris hauled away so you can free up space. We always offer various solutions that make the best sense for the situation. Rather than dealing with estate sale organizing, we give our clients an offer for all the items, the process is quick, and the client is happy to get the money right away. If an on-site estate sale makes sense, we will also recommend that. In our 8 years of experience in the industry, we have served over 600 clients and built a connection with various industry professionals to ease the entire estate liquidation process for you. Whether it’s an estate buyout, estate cleanout, debris removal, hauling away particular items, let us know and we’ll advise you on the most efficient and cost-effective method without you having to lift a finger. We always offer FREE estate evaluations, and our team is eager and ready to assist you if you’re thinking about organizing an estate sale or liquidating any personal property. New Kids on the Block is my favourite band of 90s. NKOTB had so many hits! The ones I remember are ‘Tonight’, ‘Baby, I Believe In You’ and, of course their hit ‘Step By Step’. These are real songs, not garbage like today! And it is sooo good NKOTB have a tour in 2019! And I’m going to visit their concert in 2019. The concert dates is here: New Kids on the Block tour Sacramento. Click on it and maybe we can even visit one of the performances together! New Kids on the Block is my favourite band of 90s. They had so many hits! The ones I remember are ‘Tonight’, ‘Baby, I Believe In You’ and their hit ‘Step By Step’. These are real songs, not fake like today! And it is awesome they have a tour in 2019! So I’m going to visit New Kids on the Block concert this year. The tour dates is here: New Kids on the Block tour list. Click on it and maybe we can even visit one of the performances together! Excellent goods from you, man. I’ve understand your stuff previous to and you are just too great. I actually like what you have acquired here, really like what you’re saying and the way in which you say it. You make it enjoyable and you still take care of to keep it smart. I can not wait to read far more from you. This is actually a tremendous website. This awesome blog is obviously educating and besides diverting. I have picked a bunch of interesting things out of it pakistani teens. I ad love to come back again and again. Thanks! Thank you for your entire work on this site. Debby take interest in setting aside time for investigation and it’s really simple to grasp why. A number of us learn all about the compelling tactic you deliver efficient suggestions by means of your website and as well encourage participation from visitors on the situation while our favorite princess is without question discovering a whole lot. Take advantage of the rest of the new year. You are always doing a first class job. I and also my guys appeared to be reading the great tips and tricks on your website and then then developed a terrible suspicion I had not expressed respect to you for those secrets. These boys became for that reason glad to study all of them and have without a doubt been making the most of them. We appreciate you turning out to be very considerate and for obtaining these kinds of superb things millions of individuals are really desperate to be informed on. My sincere apologies for not expressing gratitude to you earlier. I simply wanted to say thanks all over again. I am not sure the things I could possibly have done without the concepts provided by you concerning that concern. It seemed to be a distressing crisis in my view, but taking note of the specialized approach you handled that forced me to cry with joy. I will be thankful for this support and then hope you comprehend what a great job you are always accomplishing training most people through your blog post. I’m certain you have never encountered any of us.